Gates of Fire: An Epic Novel of the Bat­tle of Ther­mopyla by Steven Press­field is a his­tor­i­cal novel that recounts the Bat­tle of Ther­mopy­lae. The book was pub­lished in 1998. The Per­sian army, two mil­lion men strong, is march­ing onto Greece. The Greeks have deployed a small army, 4,000 — 7,000 men against the Per­sians and chose to make their stand at the geo­graph­i­cally advan­ta­geous Ther­mopy­lae. Lead­ing the Greeks are 300 Spar­tans who hope to delay the army enough for Greece to get together a defense plan. They know that is a sui­cide mission. 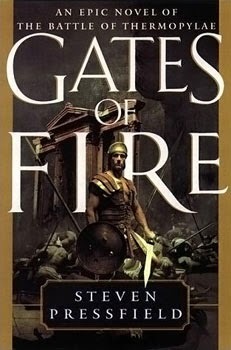 Gates of Fire: An Epic Novel of the Bat­tle of Ther­mopylae by Steven Press­field is an epic book, the style is sharp, the story vivid, the his­tory pretty accu­rate, and the moral dilem­mas are still rel­e­vant in today's mil­i­tary units. I loved to read about the prob­lems fac­ing the Spar­tan King and his army com­man­ders, the sol­diers and their ser­vants. The books is a fic­tional account of those who are about to die, know it, and still go for­ward con­tem­plat­ing life's big mys­ter­ies and gain­ing appre­ci­a­tion for their com­rades, and those they left behind. I truly enjoyed the fact that the author pays atten­tion to his­tory and imag­ines what it would have been like for his pro­tag­o­nists to pre­pare for bat­tle and death. Mr. Press­field under­stands the notions of honor in the con­text of ancient Greece and writes about it in a mov­ing, seri­ous way. The book does not glo­rify bat­tles, in fact there is much mis­ery, stench and car­nage on the bat­tle­field. If any­thing, glory in bat­tle is rewarded after the fact, not during.